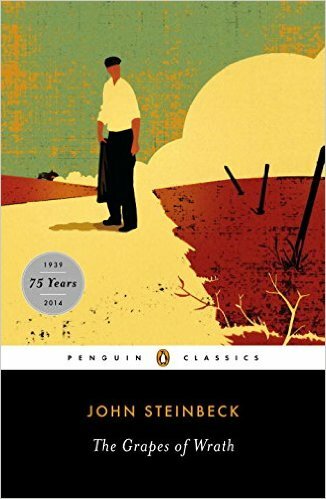 Grapes of Wrath, a highly immersed and all encompassing head first dive into the life and heart of the 1930’s Dust Bowl migration and transformation of America, is a difficult yet important read. It opens and closes with the same hot smell of dusty air, sun bleached wood and the scraping by of human existence that bookends the era it depicts. While reading, and even as it ends, the story illicits the same response – drained. Drained from the fight, drained from the journey, and drained from the exhaustion of hope. Grapes, as any Steinbeck, brings every sense into action but refuses to offer more than a slight shimmer of hope as you move from disaster to disaster, heartbreak to heartbreak. What the lack of clear and present hope does offer is a gut wrenching look into the fearless and often blind resolve of the human spirit. The most shocking and powerfully unexpected discovery was the 1930’s to Present Day correlation of how people from a place not like your own are viewed and treated. A people lured by the promise of well paid work only to find hostility, hatred and spite. My Three Word Review was Difficult But Necessary. If a people from a few states over were treated with such disdain what does this dusty tale have to say about us and our acceptance of others – from further?